This is another emergency store cupboard meal for when you’re staring down starvation and you need to crack open the super quick, vegetarian meals file. This is for the nights when you’re absolutely knackered, you do absolutely not want to go to the shops and you need to eat before nine or ten o’clock at night. In the best of all possible worlds use a a good quality ketchup but I’ve made this curry using plain old Heinz ketchup and it’s still been bloody delicious. Make sure you adjust the lemon juice to counteract the sweetness of the ketchup, you want the right balance of spicy, sweet and sour. 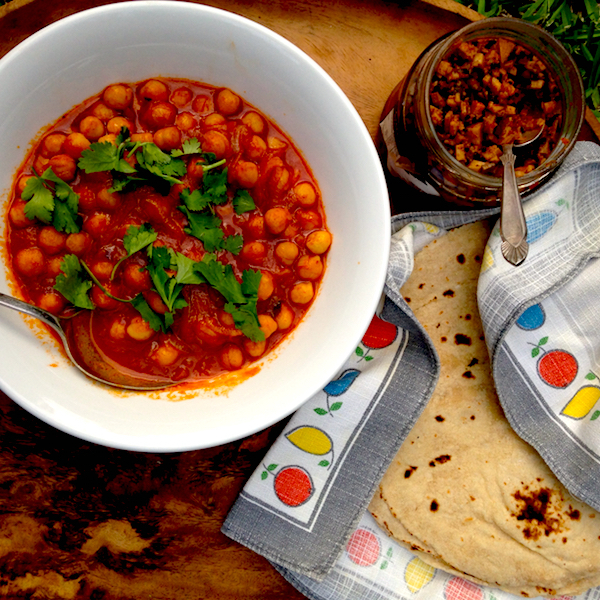 There is something about the lurid red color of this chickpea curry that really makes my inner child sing. If chickpea curry doesn’t float your boat you can make a quick ketchup chilli bean for tacos or burrito bowls. Swop out the chickpeas for kidney or white beans and replace the curry powder with some ground cumin and chilli. You can serve this curry with a dollop of yoghurt, some rice or flat bread and call it dinner, but if you want to get a bit more lavish a good yogurt raita will make it truly special. Heat oil in a frying pan. Saute onion until soft and golden (About 8 minutes) Stir in ginger, chilli flakes, garlic, curry powder or paste. Saute for 1-2 minutes until spices smell fragrant. Add chickpeas, tomato ketchup and enough water to get a saucy consistency. Simmer for about 5 minutes until flavors meld. Add lemon juice, salt and pepper to taste. Add more lemon juice if needed. The lemon is needed to balance the sweetness of the ketchup. 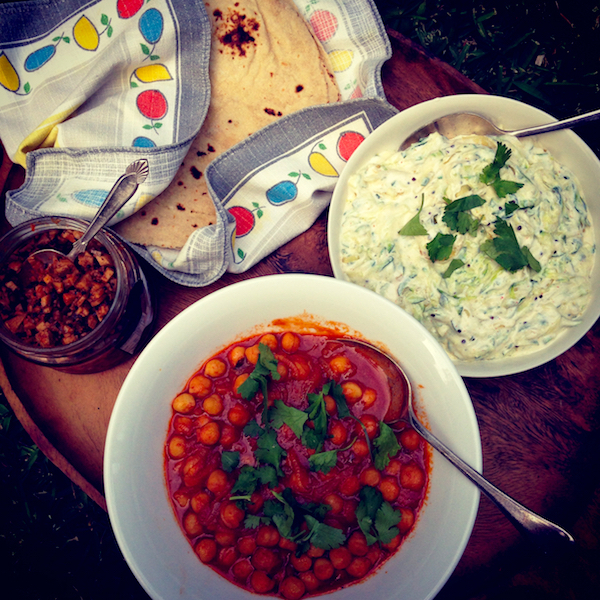 Serve with flatbread or rice and accompaniments of yoghurt raita and an Indian vegetable salad. For chilli beans – Use kidney, borlotti or white beans. Nix the ginger and curry powder and replace with 1 teaspoon of chilli powder and 1 teaspoon cumin or 2 teaspoons of Taco spice.